I do not have a good record with anything capable of earning the title of “gimmick” Pokémon – Pokémon whose schtick is some unique move, ability or game mechanic that was so clever Game Freak felt they could stop there, and didn’t need to have the Pokémon be any good or the design make any sense. Today we decide whether Oricorio, the dancing honeycreeper Pokémon, fits that description. Four interchangeable and mostly cosmetic forms, a weird signature move, a weirder ability… the phrase “walks like a duck, quacks like a duck” comes to mind, but let’s take a closer look. Oricorio’s English name references the orioles, a family (or rather, two unrelated families, one native to the Old World and one to the New) of brightly-coloured insectivorous songbirds. Her names in other languages are more generic references to birds and dance, and her actual design probably draws, if anything, not on the orioles but on Hawaiian honeycreepers – another family of brightly coloured songbirds, most of them in various shades of yellow and red. Like “Darwin’s finches” in the Galápagos Islands of Ecuador, Hawaiian honeycreepers are famous for having rapidly adapted from a single basic form to fill a wide variety of different ecological niches. Some have short, thick beaks that can crush seeds, some have long, thin beaks for spearing insects, and others have curving beaks for sipping nectar from flowers, hence the name “honeycreeper.” The technical name for the phenomenon is “adaptive radiation,” and it’s particularly common on remote islands, like the Hawaiian archipelago, where there may be a large number of unoccupied ecological niches for a species to diversify into. Oricorio, accordingly, has four forms, which individuals can switch between by feeding on the sweet nectar of special flowers that are unique to each of the four main islands of Alola. The different colours of the flowers correspond to the meanings of each of the islands’ names in Hawaiian: yellow flowers on Melemele, pink on Akala, red on Ula’ula, and purple on Poni. 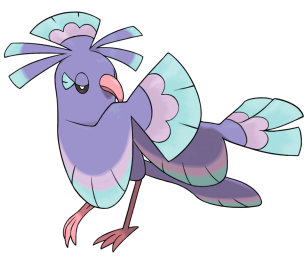 Wild Oricorio can be found wherever the flowers grow, and mimic their colours, but also gain different costume-like features that evoke a distinctive style of dance from the real world, characteristic of particular regions, with personality traits to match. 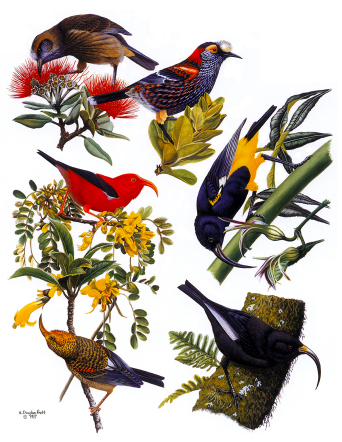 A selection of Hawaiian honeycreepers, from the art of ornithologist Douglas Pratt (more at http://www.hdouglaspratt.com/artretrospective.html). Each form has a different type: Electric/Flying for yellow, Psychic/Flying for pink, Fire/Flying for red, Ghost/Flying for purple. 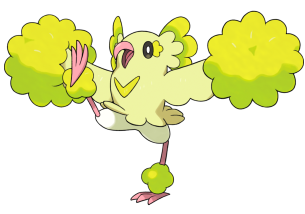 The yellow, Electric-type, Melemele Oricorio is energetic and cheerful, with puffs of feathers like a cheerleader’s pom-poms on the end of her wings – a North American style of dance, associated with giving energy to others. 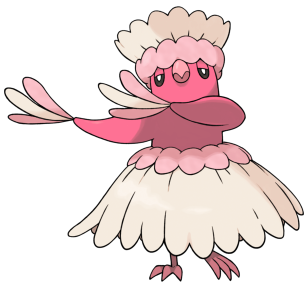 The pink, Psychic-type, Akala Oricorio is laid-back and relaxed, with a long skirt and crown of pale feathers that bring to mind a Hawaiian pā’ū skirt and lei, the paraphernalia of hula dance, which is linked in modern pop culture with tropical relaxation. 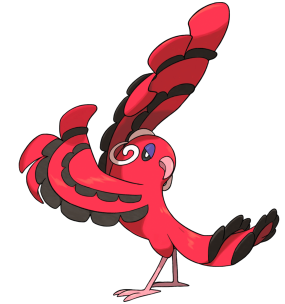 The red, Fire-type, Ula’ula Oricorio is proud and passionate, with frills of feathers like a flamenco dancer’s long dress, and white curlicue feathers that evoke hooped earrings, evoking the intense traditional dances of southern Spain that are now a shorthand for burning, desperate love. Finally, the purple, Ghost-type, Poni Oricorio is calm and quiet, with fans of feathers at the ends of her wings like the sensu fans used by geisha in old-fashioned Japanese dances that still evoke tradition and ceremony. We’re also told that the purple sensu Oricorio’s style of dance famously reminds immigrants from Kanto of the traditional dances of their homeland, just to push home that these styles are meant to have geographical and cultural resonance, as well as emotional connotations. Their different styles of dance are said to have corresponding effects on onlookers; the pom-pom style dance giving energy to friends, the pā’ū style dance lulling and slowing enemies, the baile style dance “causing its enemies to combust in both body and mind” (ouch), and the sensu style dance “sending the minds and hearts of its enemies to another world” (ouch?). Those four distinct personalities and the magical effects associated with the dances link Oricorio’s core theme of dance with the characteristic traits of her four possible elements – Fire-types are passionate, Psychic-types are sedate, and so on. This is quite important, since Oricorio otherwise has relatively few connections to those elements (as we’ll see later). The point of all these different styles is probably to emphasise that Alola is multicultural, like the real Hawai’i, where American, Japanese and Polynesian (and to a lesser extent Iberian) culture are all important parts of the regional identity. We should probably imagine that, for the people of the Pokémon world, all those styles of dance and their paraphernalia are based on Oricorio’s dances and plumage (in the same way as, for instance, the Roman alphabet actually comes from the Unown). There is something a little bit odd going on here, though. Hawai’i’s multiculturalism is essentially a legacy of colonialism, of American, Iberian and East Asian interference in, and immigration to, the islands. The real-world dance styles that Oricorio is based on – with the exception of the Polynesian pā’ū style – are relatively modern imports to Hawai’i. But Oricorio is not native to Kanto, Unova, or Kalos (the closest region we have to Iberia so far); to our knowledge, she is found only in Alola, and her different forms have specific niches that relate closely to the floral ecology of the four major islands. It seems reasonable to think that the four forms all originated right here, in the Alolan archipelago, and that the resulting dance styles were also adapted by humans in Alola. Should we turn it all on its head and imagine that in the Pokémon world Alola was not colonised, like Hawai’i, but a coloniser – an ancient maritime power whose kings had a ship in every port and a finger in every pie? Did Alolan sensu dancers introduce the forms they learned from Oricorio to Kanto and Johto centuries ago? Does the stamp of Oricorio’s intercontinental influence represent the last remaining trace of an ocean-spanning empire that left different shards of its cultural heritage all over the Pokémon world? …or is this just the kind of subtle nonsense that happens when you create a particularly anthropomorphic Pokémon without thinking through what it would imply about human culture in the Pokémon world? Such a question, dear readers, this meagre blog is hardly adequate to answer. We are, however, reasonably equipped to answer the less speculative question of whether Oricorio is actually any good. Oricorio seems at first to be a pretty rubbishy fast and frail special attacker. And… well, in singles, she kind of is. She’s got good, but not excellent, speed and special attack, average defences, and a movepool that makes me sad. To elaborate – with one exception, the only special attacks she learns are Flying attacks and Hidden Power, and of the Flying attacks, Air Slash is below average in power and Hurricane is below average in accuracy (barring appropriate weather support). Heck, she doesn’t even have any attacks of her own secondary types on her move list – except for her signature move, Revelation Dance. This is a respectably powerful special attack with no secondary effects, but one interesting property: its type changes to match the type of Oricorio’s dance style, Electric, Psychic, Fire or Ghost. In principle it’s a cool little trick that links Oricorio’s in-game tactics to the central features of her design. In practice, it means that, although Oricorio technically has Electric, Psychic, Fire and Ghost attacks, she can’t have them at the same time, which is what she would actually like, because there’s no way to change her style mid-battle. In some ways, Oricorio would be better off without Revelation Dance, since it would force Game Freak to give her actual attacks from each of her possible types. The support options are a bit more inspiring. Oricorio has Baton Pass, respectable speed, and a few useful set-up moves, including Agility, Calm Mind and Swords Dance, and she probably wouldn’t be terrible at passing buffs, although her defences leave something to be desired. With Calm Mind, Baton Pass, Revelation Dance and either Agility or a Flying attack, she can help out a more competent team member without being totally helpless herself, although there are probably better Pokémon out there for the job. She can use her speed to Taunt other support Pokémon, and she can heal herself with Roost. U-Turn lets her dart out of danger, although it’s largely superfluous on a Baton Pass set, and probably not much good on a more straightforwardly aggressive set either, since Oricorio pretty much needs a turn or two of Calm Mind setup before she can do a worthwhile amount of damage. There’s not much else to give her more variety. Even Swords Dance can’t really enable a proper physical attacker set, since Oricorio’s base score is not impressive and her movepool basically extends to Acrobatics and Steel Wing. But don’t worry – the best is still to come. Oricorio’s most interesting feature is the unique Dancer ability, which immediately copies any “dance” moves used by another Pokémon (Oricorio still gets her regular turn). In singles, this is situational at best; mostly it makes Oricorio an interesting switch-in to some Dragon Dance or Quiver Dance sweepers, since they won’t be able to outrun her. In doubles, on the other hand, this ability allows Oricorio to really shine and do all kinds of ridiculous stuff. You see, Oricorio will also copy her partner’s dances, letting her piggyback off their setup moves, particularly Quiver Dance. Strictly speaking you could also try this trick with Swords Dance, but again, Oricorio’s poor attack stat and physical movepool advise against it. Special mention here goes to Volcarona, who can buff Oricorio with Quiver Dance and give her free attacks with Fiery Dance, or to a pair of Oricorio (if you’re allowed two Pokémon of the same species on a team, which you often aren’t) who will copy each others’ Revelation Dances. Lilligant is also an interesting option here – with her Own Tempo ability, she’s immune to confusion, so you can get Oricorio to disrupt your opponents with Teeter Dance without harming Lilligant, and Oricorio will copy both Quiver Dance and Petal Dance off her. Practically the only downside is that you have to actually use Lilligant. Some credit should also go to Pheremosa and Ribombee, who, along with Volcarona, learn Quiver Dance and are faster than Oricorio, ensuring that she gets a special attack boost before her own first attack. In any case, if you can set Oricorio up to get a free Quiver Dance, she rather suddenly becomes an extremely threatening special attacker with quite solid special defence. Her movepool is still weak, with just Air Slash or Hurricane, Revelation Dance and an appropriate Hidden Power (Ice for a pom-pom Oricorio, Grass for a baile Oricorio, or Fighting for a pā’ū or sensu Oricorio). However, she’ll now have the power to bludgeon enemies into submission even through resistances, and with the right partner she may also be able to cheat out a bunch of extra Fiery Dances or Petal Dances. In any turn-based game, the power to just get extra turns for free, even in such a limited way as this, can be tremendously game-breaking, to the point that I actually sort of understand how limited Oricorio is in other ways. She’s rubbish in singles, and I don’t think there can be any changing that, but a good dance partner in doubles can let her steal the whole show, and with better defences and a good movepool she might become downright unstoppable. Take her for a spin and see if you can make her work – just remember that Cresselia’s Lunar Dance kills her instantly. I can’t help but like Oricorio. The fact that something so unassuming in a standard battle format can become so incredibly dangerous in a multiple battle, and in such an unexpected but delightfully thematic way, is appealing. I do wish Oricorio were less garbage in singles, and I really wish there were more to distinguish her different forms, but I’m happy to allow that, from a game design perspective, the nature of what her Dancer ability does is so dangerous that it makes a lot of sense to just give her a basic kit to begin with, then tack on a larger movepool in subsequent generations if she doesn’t appear to be breaking anything. The design, too, is very Alolan, emphasising the multicultural heritage of modern Hawai’i while tying in with an important real evolutionary phenomenon – even if it does leave me with some odd questions about what, exactly, Oricorio’s relationship with the history of Alolan dance is supposed to be. So, gimmicky? Oh, indisputably – but, miraculously, a decent job anyway.